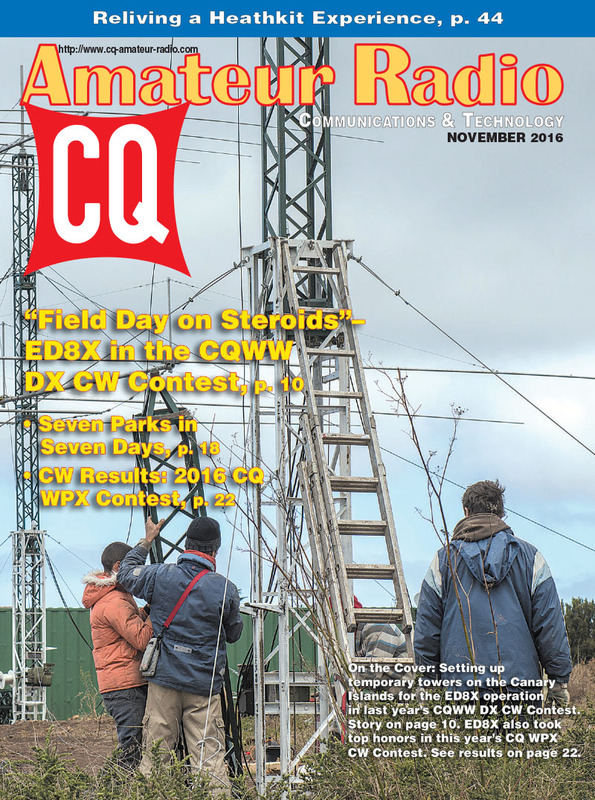 November is prime time for contesters – bracketed by the CQ World Wide DX Contest SSB weekend at the end of October and the CW weekend at the end of November – and we've got a mini contest special in our November issue. We start with a behind-the-scenes look at a big-gun operation from the Canary Islands during last year's CQWW CW weekend (the author calls it "Field Day on Steroids"! ), followed by a real Field Day story about a pair of hams who operated the event together twice – with a 40-year gap in between! 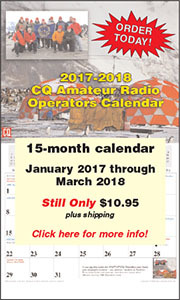 We've also got the CW results of the 2016 CQ WPX CW Contest and the rules for both the 2017 CQWW 160-Meter Contest and the 2017 CQ DX Marathon. There's plenty for non-contesters as well, starting with a look at two ham friends who set out to put seven National Parks on the Air in seven days! We also take a look at hooking up ham radio foxhunting with geocaching, and we report on the results of the Amateur Radio Direction Finding World Championships in Bulgaria, where U.S. foxhunters won seven medals. Plus, columnist KH6WZ recounts his experience with tearing apart and rebuilding a Heathkit vacuum tube volt meter (VTVM). Finally, Propagation Editor NW7US firms up his predictions for the CQWW SSB weekend (Oct. 29-30), and provides an initial projection for the CW weekend (Nov 26-27). Neither looks great, but remember … the CQWW makes its own propagation! 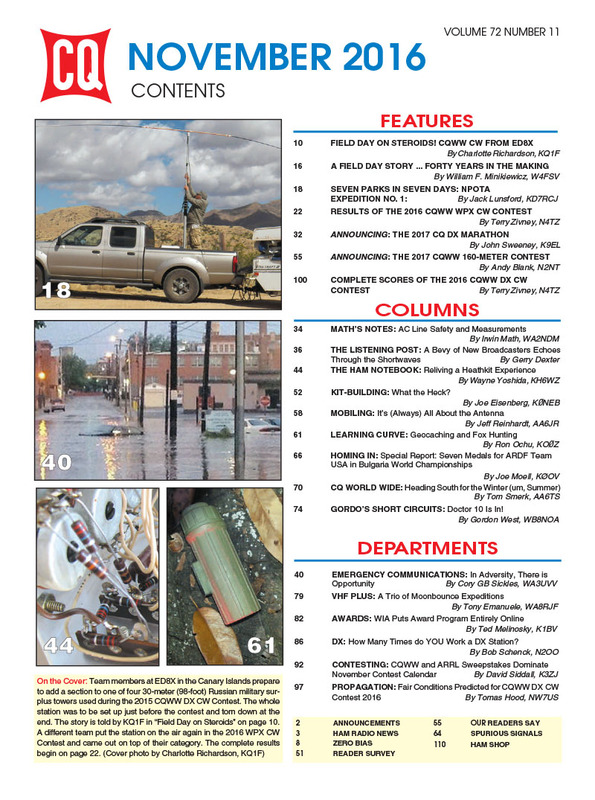 That's a brief look at what's coming up in the November issue of CQ magazine. For information on becoming a CQ subscriber - click here! On the Cover: Setting up temporary towers on the Canary Islands for the ED8X operation in last year's CQWW DX CW Contest. 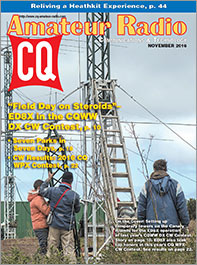 ED8X also took top honors in this year's CQ WPX CW Contest. 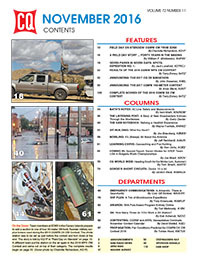 Story plus contest results in this issue.